Chloe Zhao's The Rider was one of 2018's best-reviewed films, and honestly, it got the cold hard shaft this awards season, straight up. Fortunately, others have noticed Zhao's talents and she's making the big leap to Marvel's The Eternals at some point. But there's a new film that looks to be jumping ahead of that in line, and it already sounds pretty damn good. Zhao will direct Oscar winner Frances McDormand in Nomadland, which Fox Searchlight has snatched up the rights to. The film will continue Zhao's practice of using non-professional actors such as newcomers Linda May and Charlene Swankie, alongside McDormand and David Strathairn. 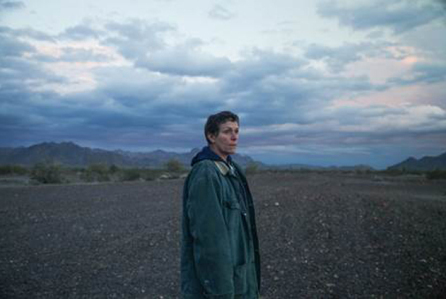 Here is the road movie's synopsis: NOMADLAND is a road movie following Fern (McDormand), a woman in her sixties, who after losing everything in the Great Recession embarks on a journey through the American West, living as a van-dwelling modern-day nomad. A signature of Zhao’s, the film includes real people turned actors including Linda May and Charlene Swankie.